Any of these books would be a treat for someone who loves New Mexico and doesn’t (yet) live here. But they also give the gift of a heightened sense of appreciation for one’s home state, which enjoys a robust literary scene from north to south. Mabel Dodge Luhan’s name is often tossed around as a doyenne and patroness who lured luminaries like D.H. Lawrence to Taos. In Intimate Memories, edited by Lois Palken Rudnick (UNM Press), a new autobiography that includes formerly off-limits passages, we follow her personal and geographical progress as she grows up in Buffalo, moves to Venice as a young married, holds court in Greenwich Village, then travels to New Mexico on a whim in 1917. We also luxuriate in her fine writing, which firmly shifts her from the role of salon host to artist. In the introduction, Rudnick says that she often thought, while reading Luhan’s copious memoirs, that she just needed a good editor. Rudnick has proven herself to be just that, shaping the “highly condensed” autobiographical material to impart a sensitive, vibrant, and dynamic journey from Buffalo’s repressed Victoriana to the gentle, fertile simplicity of Taos. Anyone who has ever noticed that New Mexico completes and heals them will resonate with Mabel Dodge Luhan’s transformation. Another Taos character, Max Evans, relates a series of colorful adventures as a writer sucked up into various Hollywood dust storms both in New Mexico and in Los Angeles. Goin’ Crazy with Sam Peckinpah and All Our Friends, as told to Robert Nott (UNM Press), is a smoky, lickered-up, blustery dispatch from the author of The Hi Lo Country, about his wild ride as sidekick to Peckinpah, the director of such films as The Wild Bunch and Pat Garrett and Billy the Kid. Along with copious L.A. scenes and numerous star cameos, New Mexico shows up as a location for films, and as Evans’ own home state. Take the rampant boozing of Mad Men, mix it with the edgy misdeeds of Breaking Bad, and swirl it in seventies showbiz, and you’ll get a sense of what this book captures. One more riff on NM’s connections to Hollywood comes from best-selling Pie Town novelist Lynne Hinton of Albuquerque, who has taken on the mystery genre in Sister Eve, Private Eye (Thomas Nelson). A motorcycle-driving nun from Madrid is the gumshoe, and an easy-to-scorn L.A. movie director is the stiff in this entertaining piece of piñon brittle. Las Cruces literary linchpin Denise Chávez’s latest novel, The King and Queen of Comezón (University of Oklahoma Press), pulls the compass south to a fictional NM border town called Comezón, translated as “Longing.” In a fevered deluge of prose, she presents various carnivalesque townspeople, laden with flaws both physical and psychological, along with tenacious desires and ambitions. Not for the faint of heart, this intensely visceral romp is an unforgettable vehicle for Chávez’s singular voice. Take matters into your own hands by making carnitas-filled tortillas with chile de árbol–tomatillo salsa, just one recipe from Dishing Up New Mexico: 145 Recipes from the Land of Enchantment (Storey Publishing). 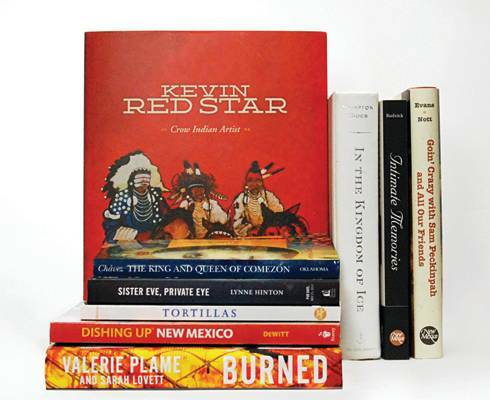 Stories and profiles accompany the recipes, contributed by author Dave DeWitt along with many New Mexico chefs and purveyors. Recipes composed of local ingredients are vibrantly matched with landscape and food photographs by New Mexico Magazine contributing photographer Douglas Merriam. Also seen in the pages of this magazine (mynm.us/kivanew), early IAIA artist Kevin Red Star’s splashy yet disciplined paintings of his people converge in Kevin Red Star: Crow Indian Artist (Gibbs Smith), by Daniel Gibson and photographer Kitty Leaken (both Santa Fe residents). The lushly illustrated biography follows Red Star’s circuitous path from his birth on Montana’s Crow Reservation to his current status as one of the country’s most collected and lauded Native artists. Hampton Sides’ 2006 book Blood and Thunder: The Epic Story of Kit Carson and the Conquest of the American West is, of course, required reading for anyone with an interest in New Mexico’s territorial history. Readers of that book by the Santa Fe–based Sides surely have cultivated an appreciation for his masterful researching and storytelling abilities, and those same traits are eminently on display in his latest book, the New York Times bestseller In the Kingdom of Ice: The Grand and Terrible Polar Voyage of the USS Jeannette (Doubleday). Telling what the author calls “an American Shackleton story” of a late-19th-century polar expedition, Sides evokes the ethos of a colorful bygone era of exploration, and provides gripping profiles in courage of seamen bearing up under conditions of extreme hardship. to fans of television’s Homeland series, who will find relief from the neuroses that haunt the show’s protagonist, and its predilection for implausible plot twists.